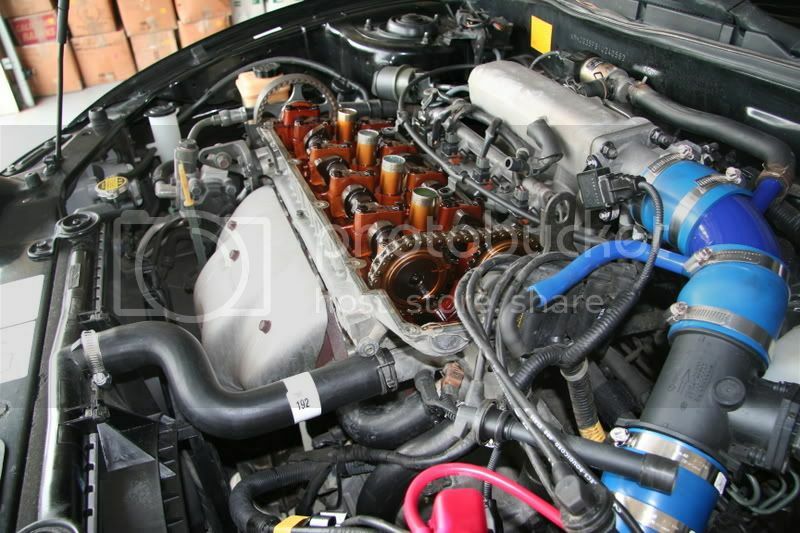 Tips: Engine will be rough when started. Let it sit and idle for 10-15mins and will then be fine. -Special thanks to UltraTibby for the old one! Excellent pix mang! It's really clear and shows everything very well. This will help quite a few people out methinks. Great DIY!! Someone should replace the on in the listing. What's the #5 journal bolt and the chain guide? Can you circle it in a pic or something? 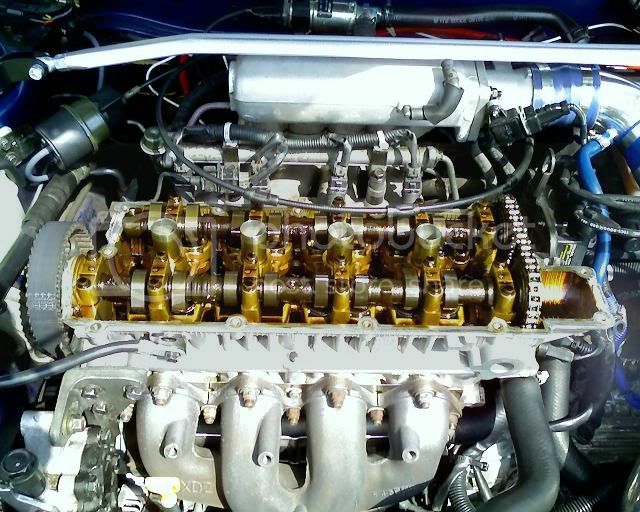 The chain guide is the thing seen above the timing chain in that pic. When removing the journal bolts on the intake side to remove the cam, you'll also need to remove one bolt on the exhaust side as it is one of two bolts holding the chain guide in place. TopSpeedFX: Are you sure enough oil is circulating through your head? 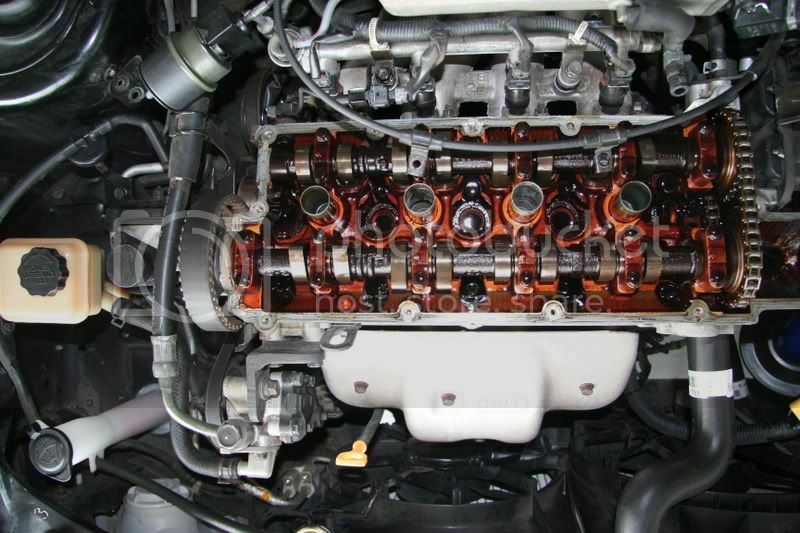 Mine had loads more oil everywhere when I removed my valve-cover... yours looks dry, nearly. I have an RD2, and I don't believe I have one, could that be possible? 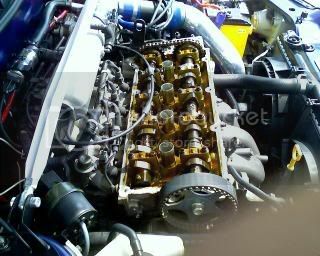 For everyone that has done the 1.8L Cam swap, was it worth it? Some other guys on here have said that they didn't have a chain guide either. Maybe Hyundai deemed them unnecessary in later models. Yep. no chainguide here either. And that valve train is DRY! StrikeEagle: your engine is RED! I didn't know what the heck the chain guide step was, so I skipped it. It turns out I dont have a chain guide either. And, yes, the 1.8L swap was worth EVERY CENT, and I bought one new off K$PEC dot com. My impressions on the results: I drove carefully for the first few miles, then got on it a bit. The tires broke loose when I mashed the pedal at around 3000RPM. I couldn't wipe the smile off my face! Just driving normally, the car feels "lighter" if that makes sense. Accelerating is easier and accelerating on the highway is VERY fun now. The only other mod I have is a conical air filter.